With mobile application development platforms (MADP), users can build mobile apps once and deploy them anywhere, delivering a near-native user experience while eliminating the cost and complexity of supporting multiple platforms and devices. Mendix’s rapid mobile application development platform accelerates the delivery of mobile apps by abstracting away from code, enabling any developer to build applications using intuitive visual models. The proliferation of mobile device types and increase in demand for mobile apps has made it virtually impossible for developers to build and scale mobile applications for all devices and platforms using traditional means. Mendix’s mobile application development platform removes the need to build mobile apps natively for multiple platforms. Instead, Mendix’s platform abstracts away from technical details, including infrastructure, provisioning, code development, and app management components. The application platform speeds the delivery of mobile apps that work seamlessly across devices and platforms and integrates with other back-end systems and processes. Mobile app development platforms, also known as mobile enterprise application platforms, offer a host of features to help achieve a near-native user experience through a more efficient, hybrid development approach. The core features and mobile development tools include responsive UI templates and layouts, instant testing functions, one-click publishing to any public or private app store, and drag and drop functionality to leverage native device functions in your apps. Mendix is a leader among application platforms. Find out how our customers deliver rich, near-native user experiences. Easily collect feedback, iterate, and redeploy hybrid mobile apps, etc. as changes are required, so that your business stays relevant within the market. As a premier cross-platform mobile application development suite, Mendix apps will work on nearly any device or OS – including Android or iOS. 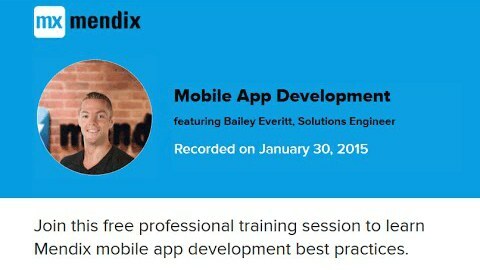 Build apps for any device with Mendix. Learn more about the mobile application development platform that makes rapid application development possible. How to Develop Mobile Applications? Begin with the application concept and planning stage and move onto putting the different components of the application together. Once core functionality is complete, launch the app. Revisit and update the application until full desired functionality is realized. Utilizing a low-code development platform like Mendix facilitates being able to plan out, build, deploy and improve applications intuitively. Learn More. Apps built on our platform can run natively on devices running Android or iOS. Mendix applications will work on Apple iPhone, Samsung Galaxy, HTC, Motorola devices and most other smartphones. Cross platform mobile application development ensures that an app works across all devices, regardless of screen resolution or operating system. Since Mendix apps are cloud-based, every application is available on different platforms out of the box. What Mobile Application Development Tools are Available? Every application built with Mendix is intuitively configurable to suit the needs of the three main device types: desktop, tablet and mobile. With our web and desktop modelers, it is easy to set up different layouts and UIs for each experience. What Types of Mobile Apps Can you Build? Applications built with Mendix are only limited by the developer’s imagination. Some examples of applications build by Mendix users include IoT enabled logistic smart apps, customer portals for insurance and medical customers, and a pantheon of digital transformation apps across countless of industries. Visit our gallery for examples of real life applications.